I turn 24 two weeks today, which is a scary prospect for me, as there are still a lot of things I want to achieve and reach a point where I feel truly content and happy in my life. I feel approaching my mid-twenties I need some direction, and crucially focus. This list may just serve as a reminder of what I want to achieve – of course I may not achieve them all, but in a years’ time I will be able to tick off those which I have managed to do and maybe reassess the reasons why I haven't achieved the others. A lot has changed in the past couple of months for me, I have challenged myself and pushed myself a lot and although it’s not been easy, and this has been met with plenty of ups and downs along the way, I am beginning to see a more confident me. But this is only the beginning and I know I have a long way to go. Find out what I want to do as a career. My biggest insecurity is my career. I’ve never known what job I have wanted to do, and have always struggled trying to find my path in life. It’s important for me to find exactly what it is I have been looking for all these years – even if I don’t catch it, if I know what it is that I want to do - at least I have the foundations to make it happen in the future. Challenge myself. A lot of my problems in the past have stemmed from my confidence - I think what I am beginning to realise is that I have to allow myself to push boundaries and do things differently, because when I do, I actually feel a whole different me. Stop being embarrassed. I always no matter what put up a barrier and convince myself people think badly of me. I need to let that barrier down, and realise that to progress is to not hide away anymore. Don’t compare myself to others. The one crucial piece of advice that is always so hard to follow however old you grow. It’s so easy to be jealous, but so hard to be pleased for someone. I know I’ve felt this at certain times of my life, and to some extent still feel it now. Aim High. I always aim low. When applying to jobs, when writing bios, I always struggle to sell myself. I need to remember I am just as capable as everybody else and aiming high can be far more beneficial than aiming low. Secure a permanent job. I’m under no illusion that ‘dream jobs’ are easy to find, they are extremely rare and hard to come by. Although I do want to find out what my dream job is, I know finding a job without an expiry date or end would have the potential to change and enhance my life for the better. Income wise, this undoubtedly would change my life. Get rid of all the old clothes I don’t wear anymore. I have so many clothes that no longer fit, or just don't suit me anymore. It's time to get rid of those. Join a club. One of those things I’ve always wanted to do, but never bottled up enough courage to do. WI, craft or book club? Continue my letter writing. 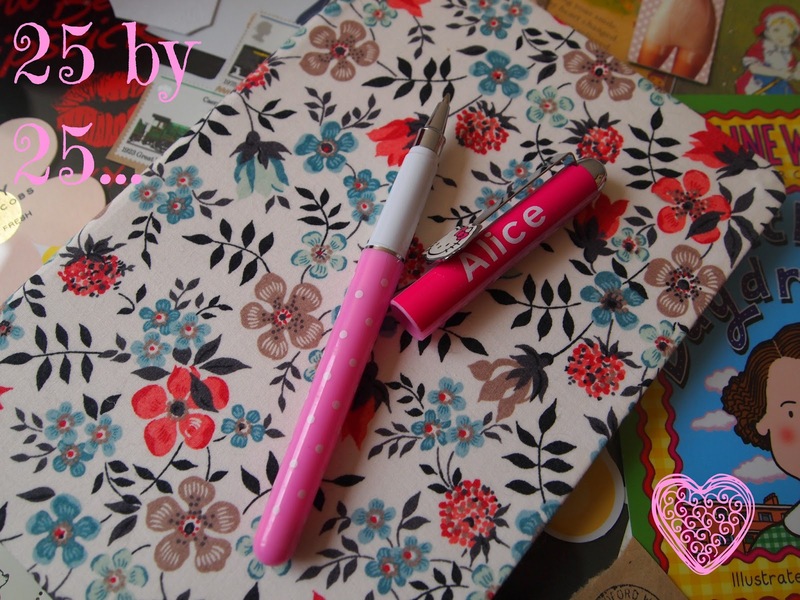 Get to know my newest pen pals, as well as keeping close bonds with my oldest ones. Visit G in Cambridge. My best friend relocated to Cambridge a few months ago, which means we are almost 3 hours apart in distance now. This definitely means a wonderful adventure to visit her. Meet up with bloggers again. When I went to Norbury Manor in March I had the best time, I felt so comfortable in other bloggers company. It was so amazing to finally meet girls I had been following and chatting to for years. To meet in person was such an incredible opportunity. This is something I have to do again. Believe in myself. Self-explanatory really. Have a seaside adventure. With the Mr by my side, fish 'n' chips and a 99 ice-cream! Use my sewing machine again. The one I disowned after finishing college. Surely there’s a project waiting to be started. Paint my Summer house at the allotment. Either duck egg blue or mint green. Find more healthy recipes. Don't get dis-heartened by low fat cooking, there's plenty more recipes out there. Stop hoarding junk. Yes I really mean it. Get my words published. In either a magazine, website or newspaper. Make some alterations to my blog. I’ve got quite a few fresh ideas with regards layouts and new posts I want to write and share on here. Reach my target weight. This is an on-going journey which has already begun and one I wish to strongly continue. Let Go. (Thank you Kat for penning this) I have a lot of vent up worry, mostly from the past. Friendships that have turned sour, memories of school and family fall-outs, job rejections etc, I have to leave these behind once and for all. Plan our 2014 Wedding. Our wedding is booked, which means I now have the journey of meticulously planning and preparing for the big day. I’ve always known I have wanted to put my own stamp on the day, and I really am looking forward to crafting my way through to marrying my true love. Be sociable. One that could only ever apply to myself. I have always been shy and introvert, but I’ve proven (this year more than any) I can speak to people. The one thing I wish more than anything is that I could just strike up a conversation without the need to pre-plan a topic or worry myself silly that I have to talk to a stranger. Never give up. Because I need to remind myself, that there is always a reason to carry on, always another chance and possibility out there. If you give up now, you will never know what was possible. I def want to meet up with you again, maybe if you're staying in Cambridge I could pop along to see you too! Fantastic list - best of luck completing them - there are some great goals and some fun things in here too which sounds like a good combo!